Drug sentencing laws in America are ridiculous. The sentencing ranges for crack cocaine have been lowered but more needs to be done. 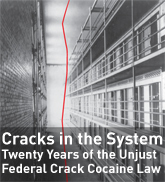 "The lunacy in crack penalties will not be eliminated until lawmakers grapple with the mandatory minimum sentences now in place." For more check out the Sentencing Project or this ACLU report.